Forget about homework and pop quizzes. 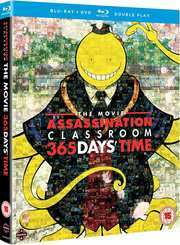 In Assassination Classroom the Movie 365 Days' Time, the killer class is back in session—sort of. Relive every moment that made you laugh, cry, and kept you on the edge through the eyes of the top two students: Nagisa and Karma! It’s been some time since Nagisa and Karma were a part of the assassination classroom. Like the rest of Class 3-E, they’ve grown and followed their own paths. But no matter how much time has passed, they’ll still remember their time with Koro Sensei and the lessons he taught them. Walking around their old classroom, the two former students reminisce about the time they spent in Class 3-E and the crazy events that went down. From the minute Koro Sensei first stepped into the classroom down to their final moments—this is a look back at the adventures of assassins in training!